Tagged: free speech ain't always free, me me me, the Revolution will be televised... on Periscope, those who deny freedom to others deserve it not for themselves. 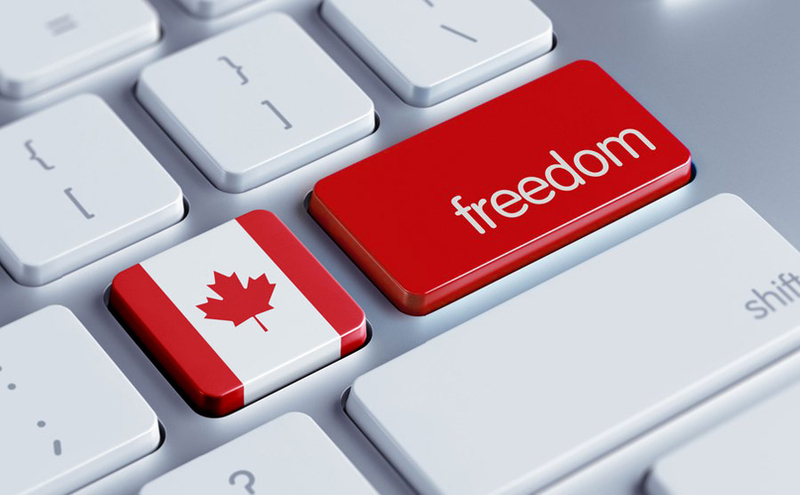 13 Responses to Do we have internet freedom in Canada? I sent you an email with my thoughts. Feel free to edit it (if it needs it) and pop it in here. As a technologist and based on my web experiences I’d say that I have been pretty much 99% free to navigate with little to no concern, providing I surf by the rules of where and what I visit. Do you think we have internet freedom in Canada? In general I think we do. Are there laws or upcoming bills that could be de-ratified and re-ratified that would make it less free? Possibly but I think the new Federal government is more open to discussion and will be less stringent than those they replaced. I work in the higher education world, specifically research, where ethics are primordial to the way we manage our internet usage as well as store, retrieve and share our data and knowledge. The last decade of internet use in our labs has shown me that it has been pretty free and unencumbered. My personal use may differ slightly but mostly in relation to accessing non-Canadian content or unsanctioned media (see Netflix) due to CRTC-type regulations. Are you free to say what you want? To do what you want? In general I think so but I’ve become more careful or now completely avoid some areas, namely national media comment sections. The amount of abuse that takes place by “trolls” that believe they have carte blanche to say anything, limits my freedom to participate. Specific comment board shutdowns at The Toronto Star, The Toronto Sun and TSN are examples of recent corporate decisions to ban what was once free dialogue. I’d look into why those decisions were taken but I think it falls in line with losing some of our web freedom. Also, as you well know, we have our semi-famous Brian Burke blog episode that taught us a few lessons. To download what you want? Are the ISPs or the government screwing you over? Are you being blocked somehow? Are “they” watching you? Although not often, I’ll run network “sniffing” tools to traceroute a given site but in general I’ve rarely seen my ISP (Videotron for 17 years at home and FIDO for cellular) choke access to any information. I know for a fact that Videotron does watch my household. A few years back I received an email detailing a film my daughter downloaded. The content of their message was very specific with date, time, file, size, site, etc. We were given a warning and that Videotron would prosecute if the owner of the content (our copy was a torrent) came after them. Nothing ever transpired. My daughter learned a good lesson. Another item to add is the much more prevalent use of private VPN apps or browser extensions/plug-ins to get to internationally-sourced content. Although useful, I doubt most Canadians know the details of what actually happens when the tunnelled connection is established. Might be an interesting adjunct to your research. Also, those darned Facebook privacy settings, turning on location services on smartphone apps and not reading those long-winded Terms and Conditions of use (e.g.. Apple). Accept! Good luck Al. Keep us posted. Allen wow your big time now. I say we are very free. In particular we can use Kodi to our hearts content. And I have almost run out of content. My only issue is the price. Its way to high and the monoploly situation needs address. Obviously everyone who uses any electronic medium is being watched. Edward Snowden proved this. Canada in this regard is much freerer than our peers in the USA and England. Until we sign the TPP the average Canadian can surf and even download without fear of substantial financial or any criminal penalties. This could all change with one act of parliament. As long as there is an appropriately implied alleged its apparent individuals in Canada can say outrageous things with impunity. The webpage at http://allenmendelsohn.com/wp-comments-post.php might be temporarily down or it may have moved permanently to a new web address. oh my you should be afraid steve! ironicly a post praising internet freedom with a freedom loving lawyer has to be moderated:) Maybe I have a bad record? Another bit of irony Allen. The person regonized internationally as one of the top internet lawyers in the world has more degrees than a thermometer. Yet they are all from an old world brick and mortar institution, you dont have one degree from a Internet University. I recommend reading The Circle by Dave Eggers, Vintage Books, 2014. It is opening my eyes and making me think. Maybe we have too much Internet “freedom” and get lulled into a sense of complacency (I did and got a wake up call). Maybe internet companies have too much freedom to use info about users and esp. how they use and try to monetize it. oooh, that book looks amazing! I will check it ouot for sure, thanks for the recommendation.